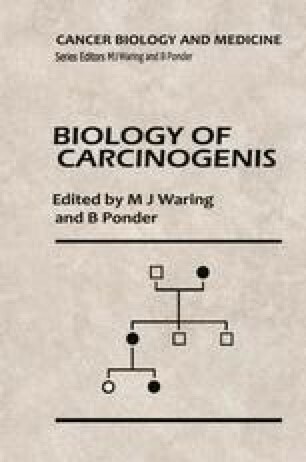 Our present ideas about the biology of carcinogenesis owe much to the classic work of the late Leslie Foulds, the second volume of whose book Neoplastic Development 1 was published ten years ago. His principal theme was ‘the general concept of neoplasia as a sequential developmental process’. This led to the definition of three groups of lesions. Group A (non-neoplastic) is exemplified by ‘freckles and other familiar consequences of over-exposure of skin to sunlight’. Those of group B (often referred to as benign neoplasms) were defined as non-invasive, and are typified in experimental carcinogenesis by papillomas of mouse skin. Malignant tumours were designated as group C; they frequently constitute the sole manifestation of disease, in which case it is assumed that phase B has been ‘masked’. Lesions of group B do not inevitably lead to malignancy, and the various possibilities found experimentally are shown in Figure 1.1 which is taken from Foulds’ studies (mainly on development of mammary tumours in mice).